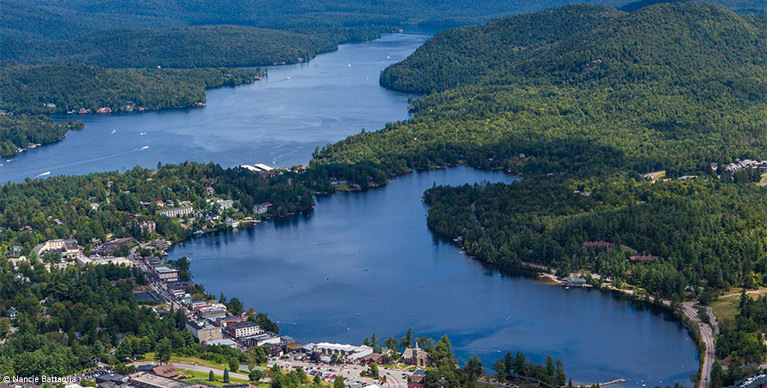 Located in the heart of the Adirondack Park in Lake Placid, New York, the Lake Placid Land Conservancy (LPLC) is a 501(c)(3) not for profit land trust that partners with landowners and communities in the Ausable and Saranac River watersheds in the Adirondack Park. We work to conserve important open spaces, viewsheds, wildlife habitats, water resources as well as recreational lands that create opportunities for people to enjoy the region’s natural beauty. Lake Placid Land Conservancy (LPLC) was created through the merger of Placid Lake Foundation (PLF) and North Elba Land Conservancy (NELC) in December, 2013. A 17 member, volunteer board and experienced staff work to support LPLC’s conservation efforts. While most of the High Peaks in the Adirondack Park are permanently protected as Forest Preserve, the lowland forest communities surrounding the High Peaks are still predominately under private ownership. Lowland forest communities of the Ausable and Saranac River valleys contain some of region’s greatest biodiversity but are also subject to the greatest development pressure. LPLC was created because of a strong and steady demand for continued land conservation in the Adirondacks. We see continued conservation of local landscapes as a fundamental component of broader efforts to maintain the region’s distinctive character.